An otherwise healthy Quarter Horse suddenly becomes sick, losing 40% of its muscle mass in less than a week. A Quarter Horse has a case of strangles (Streptococcus equi), and just when it seems recovered, loses its muscle mass in a similar way. In both horses, the muscle loss is worst along the topline and hindquarters. Is this coincidence, or do the horses have more in common than breed? Recent research has clarified this situation: In 2018, Finno and colleagues identified a mutation in a gene called “MYH1” which puts horses at risk of developing Immune-mediated myositis (IMM). Horses with one copy of the mutation are at risk, and those with two copies are at very high risk of developing the disease. The mutation has been found in Quarter Horses, Paints, Appaloosas, Ponies of the Americas, and related breeds. In 2019, Gianino and colleagues reported that the highest frequencies of the mutation are found in reining, working cow, and halter Quarter Horse lines. The MYH1 gene mutation causes a physical change in the shape of a small part of the myosin heavy chain 2X (MYH1) protein. This protein is found in type 2X myofibers, which are the fast twitch muscles found in high proportion in the topline and hindquarters. The physical change in the MYH1 protein makes it physically resemble part of the strangles bacterium. When the horse’s immune system is triggered (infection, illness, vaccination, or something unknown), the immune system may detect the mutated version of the MYH1 protein and attack it. This causes the rapid muscle loss characteristic of an IMM episode. Affected horses generally rebuild their muscle over several months, and this can be sped up by immediate treatment with corticosteroids. Some horses with the MYH1 mutation may not have acute attacks of IMM, but instead have episodes of nonexertional rhabdomyolysis (non-ER). With non-ER, horses have episodes of muscle damage that isn’t associated with exercise. They will have high levels of serum creatinine kinase (CK) but may not show any muscle atrophy. Because both IMM and non-ER are caused by the mutation in MYH1, the conditions are being called “MYH1 Myopathies”. The MYH1 mutation is semi-dominant with incomplete penetrance. Semi-dominant means that one copy of the mutation (n/My) is enough for a horse to be at risk of developing the disease. Two copies (My/My) makes that risk much higher. Incomplete penetrance means that just having the mutation is not necessarily enough to cause the horse to have symptoms – there usually needs to be a trigger of some kind for symptoms to be seen. 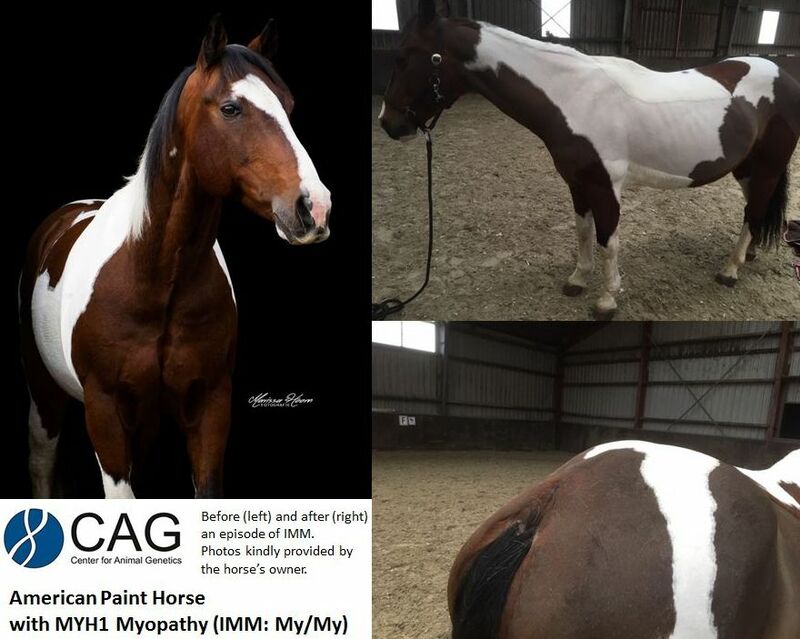 While there is no breeding ban for horses with MYH1 Myopathy, it is highly recommended that horses with two copies (My/My) are not bred, because every foal will inherit the mutation. If a horse has one copy (n/My) and an owner chooses to breed it, they should only bred to horses tested normal (n/n) for the mutation. It is simple to test for the MYH1 gene mutation. You can order the test through the CAG webshop: https://www.centerforanimalgenetics.com/product/immune-mediated-myositis-imm/, and send a hair sample (with roots) to the laboratory. You will receive results in 10-14 days. Currently, any laboratory may run the IMM test. The test went on patent in Europe in January 2019, and CAG is currently in license negotiations with the patent holders, as are other laboratories. Any laboratory which negotiates a patent license will be able to run the test. There are no exclusive providers in Europe. We are always happy to explain our testing methods and your results with you by telephone or email. Feel free to contact us with any questions. Gianino et al., (2019). Prevalence of the E321G MYH1 variant for immune-mediated myositis and nonexertional rhabdomyolysis in performance subgroups of American Quarter Horses. J Vet Intern Med. 33:897-901. https://doi.org/10.111/jvim.15393. Durward-Akhurst and Valberg (2018). Immune-Mediated Muscle Diseases of the Horse. Vet Pathol 55(1):68-75. https://doi.org/10.1177/0300985816688755. Finno et al. (2018). A missense mutation in MYH1 is associated with susceptibility to Immune-mediated myositis in Quarter Horses. Skelet Muscle 8(1):7. https://doi.org/10.1186/s13395-018-0155-0. Valberg, S.J. et al. (2018). An E321G MYH1 mutation is strongly associated with nonexertional rhabdomyolysis in Quarter Horses. J Vet Intern Med.1-8. https://doi.org/10.111/jvim.15299.